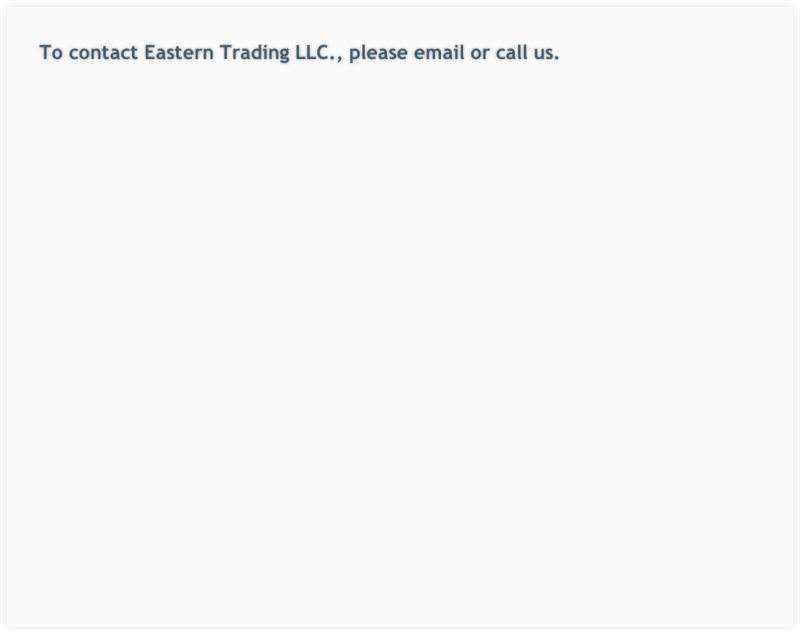 Copyright © 2003-2013 Eastern Trading, LLC., All Rights Reserved. Conditions of Use and Privacy Notice. FROM SOUTH NJ Turnpike: Take Exit # 8 of the New Jersey Turnpike. Keep right toward Hightstown/Freehold. Keep in the middle lane to US-133 West/Hightstown. At the stop light, go straight to take US-133 West to US-130 North. Take route US-130 North to Cranbury-South River Rd. Slight right onto Cranbury-South River Rd. Turn right onto Security Drive, Prologics Park, Cranbury. Go past the sign and turn Right. You will see building # 3. FROM NORTH NJ Turnpike: Take Exit #8A of the New Jersey Turnpike toward Cranbury/Jamesburg. Keep right to take the CR-535 ramp toward Cranbury/RT-32W/US-130/South Brunswick. Turn left onto Cranbury-South River Rd. Turn left onto Security Drive, Prologics Park, Cranbury. Go past the sign and turn Right. You will see building # 3. If you are coming to the office, take the first left, we are in Suite # 302. If you are making a delivery or pick-up, go past building number Three, and take the first left past the building. You will see the Eastern Trading dock on your left.